Browse through our selection of top flower gardening tips for flower garden ideas and practical advice. After all, what is more beautiful than a uniquely designed flower garden? If you love flowers of all kinds and colors, you can create a beautiful flower garden and include embellishments like statues, lighting, and carefully place rocks and borders to enhance the look of your flower garden. Here, we bring you some expert (even if we do think so ourselves) advice on flower gardening. Placement - Before you begin your flower garden, just think about this for a minute: Do you already have a spot in mind where you want to add some color? Then make your plant selection to fit the available sunlight (or lack of) in that spot. Alternatively you could select a good place that offers both direct sunlight for flowers that need the natural sunlight and indirect sunlight for flowers that don't require as much sunlight. A simple way to do a flower bed is to choose flowers that all require direct sunlight which is the easiest way to create your flower garden. Fertilizers - Don't use fertilizers until about a week or so after the roots of the flower plant have set in the soil. Choose organic fertilizers from your garden center to protect birds and pets. Mulching - A good mulch is a great way to make your flower garden attractive. You can make your own from wood chips or buy mulches in all shapes and sizes from your gardening center. Mulch is also a great way to keep moisture in your flower garden and to keep the weeds away. Weeds - Even if you have mulch in your flower garden, you may still get the annoying weed or two that pop up. When weeds appear, pull them out from the roots to prevent re-growth. 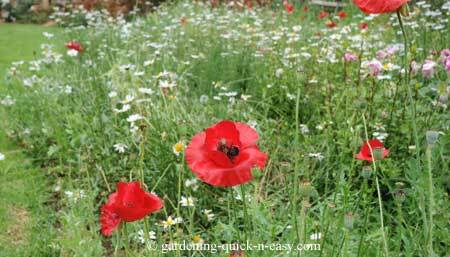 Weeds and weeding your flower garden are part of maintaining your flower garden so keep that in mind when planning your flower garden - it won't grow by itself and will need some care. Planting - There are basic steps to planting flowers. First dig a hole that is wider but not deeper than the flower container. You can start your garden with flower seeds, but for maximum effect, invest in some flower seedlings and plants at your local garden center. Once your flowers have matured, you can let them re-seed naturally. The Poppy plants in my friend's flower bed pictured below, were originally planted in 1992! The plants are left in the soil until the seed pods ripen and with a bit of help from the gardener, are opened to release the seeds. Only then are the dead flower plants removed - making space for next spring and a new crop of Poppy flowers. Loosen the soil around the roots of the flower before planting. Set the plant into the hole and cover with soil. Add a little water and then pack more soil on top firmly. At this stage of your flower garden, you will need to water it often. Spacing - Space your flowers evenly and match sizes and shapes to achieve a good look for your flower garden. 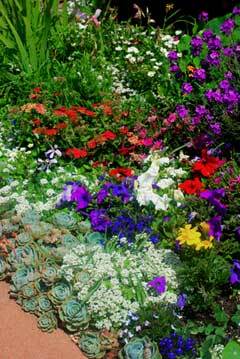 Or, design your own colored-patterned garden and add rocks and rock borders to enhance the look of your flower garden. Edging - Your garden center will carry many sorts of garden edges made of stones, rocks, and ceramics that are full of varied designs and shapes. Choose ones that will make your flower garden attractive and ask advice on how to place them. Statues are another attractive thing to add to your flower garden such as angels or other characters. Watering - When you first plant your flower seedlings, you will need to pay attention to how much water they are getting. At this early growth stage, it's important to know how much water each flower you have in your garden requires. Find out before planting flowers how much you'll need to water. To conserve water, try and pick flowers that are beautiful but don't require as much watering. © 2007 - GardenBrief.com - All rights reserved. Note: We'd love you to send us your flower gardening tips and favorite flower garden pics to feature on our new pages! Contact Us and we'll send you an email address that can accommodate your photographs.